GOSHEN — First-year head coach Shannon Houlihan continued to see aggressiveness out of her young Triton High School softball team Thursday in a non-conference game against Goshen at Shanklin Park. With four freshmen (second baseman Lauren Snyder, pitcher Madeline Doll, shortstop Jolie Groves and center fielder Erin Ogle), three sophomores (third baseman Jaelyn Bules, first baseman Abbey Viers and right fielder Kennedy Kleepsie) and two juniors (left fielder Skyla Wilson and catcher Hanna Hooley) in the starting lineup, the Trojans (3-4) continually put the ball in play against the RedHawks in an 18-3 five-inning loss. “We’ve got a lot of girls playing in sports they’ve not played before and they haven’t played together,” said Houlihan. “We’re working that defense. That’s our main struggle right now. But I’m glad the girls are hitting the ball. Triton left a runner at third base against freshman right-hander Elizabeth Ramirez in a scoreless first inning. Snyder (bunt single) and Doll (single to center) opened the game with hits. Goshen turned a double play with sophomore second baseman Sophia Koshmider tagging out Doll and throwing out Bules while Snyder went to third. The frame ended on a strikeout. Triton scored one run without a hit against Ramirez in the second. Groves drew a lead-off walk, moved to second base on an infield out and third base on a wild pitch. With one out, Groves scored on the front end of a double steal. Triton stranded one runner against Ramirez during a scoreless third. Doll drew a two-out walk and was left at first base. The Trojans went down in order against Ramirez in the fourth with a fly-out, strikeout and come-backer to the mound. Triton loaded the bases with no outs and scored two runs against Ramirez in the fifth. Viers smacked an infield single to the right side and Kleepsie reached on an error. Both scored on the same play: Viers on a wild pitch and Kleepsie on an error. Ramirez closed out the game for Goshen (4-2) with a strikeout and two groundouts. Triton used two pitchers. Ogle replaced Doll in the circle to open the RedHawks’ fourth. Goshen tallied two runs in the first, four in the second, eight in the third and four in the fourth. The RedHawks sent 11 batters to the plate in their last two at-bats. The hosts wound up with 12 hits, seven walks and two hit batsmen. Senior Sara Brenhiser drove in six runs while junior Alexis Navarro and junior Ruth Whitehead plated two each. Whitehead (3), Brenhiser (2), Navarrro (2) and freshman Olivia Koshmider (2) all collected more than one hit. Navarro, Ramirez and OIivia Koshmider scored three runs each. Goshen coach Brent Kulp was complimentary of Triton. “Shannon’s doing a great job,” said Kulp. “You can tell they’re doing the fundamentals. 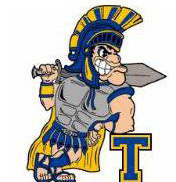 Triton visits Wawasee at 11 a.m. Saturday.